Another Beautiful Day in Paradise. The temperature was 57 degrees and warmed up nicely. Absentee Mike M came. Welcome back Mike. Mike indicated the new section of Trail from Tarpon to East Lake Road was now useable. We decided to skip our regular route and head up the Trail along East Lake Rd and see. They were still working on the new section of trail but it was useable. 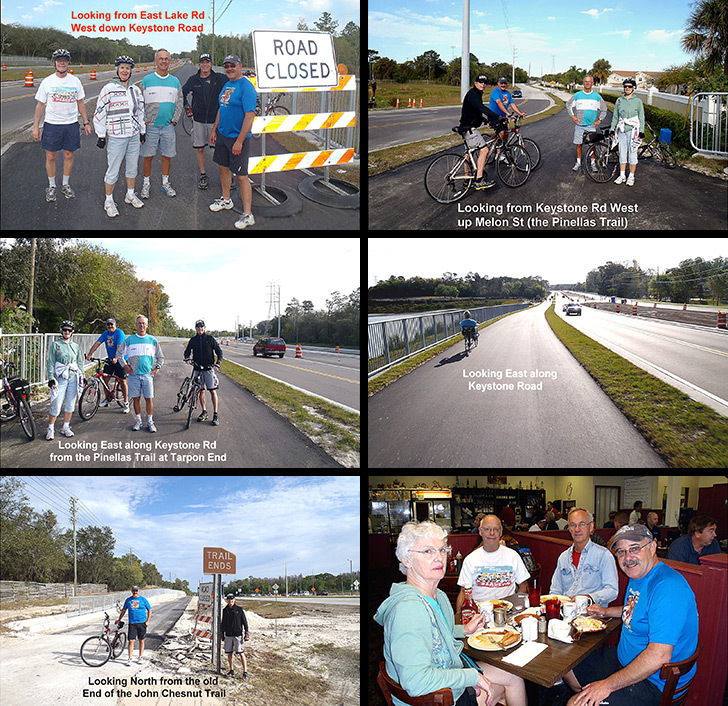 We bicycled (had no bladers) up to Keystone Rd and West down Keystone Rd all the way to the Pinellas Trail connection to Keystone Rd. At that point the Trail along Keystone Rd turned to concrete and went about another ~1.5 miles and turned into East Tarpon Ave but didn't quite make it to Hwy 19. It stopped at the cemetery/Jasmine Ave. The new section of asphalt is ~15 feet wide and wonderfully smooth except at road insertions where it is still missing the top layer. The new section of trail between East Lake Rd and the Pinellas Trail connection is ~2 miles. We had 5 bicyclers. Our round trip ride was 16.5 miles. Roger T renewed his Sponsorship since last Sunday. Thanks for the web site support Roger. We Brunched at Eve's as planned. We got right in and seated. The coffee flowed freely and the food was good as usual. Rob rated his Brunch a 9.5.